So very cute! I have watched Sgt. Frog, my husband and I find it very funny. I wondr if my step-son would enjoy it. Hi,Susie. I’m happy to hear you know about Sgt.Frog 🙂 I hope English version can express their humorous nonsense well. Each character has an unique talk and style in original version. Hi, yana. Nice to meet you(^^)/ Sorry for the late reply. I just came back from my summer trip yesterday. I’m very pleased that you visited me via hibiscus rosa noor and like my blog. She is a nice blogger, and you too. I’m now organizing a lot of photos which I took in Hawaii. Give me a little more time. I hope you’ll like the next post about Hawaii. I was just in Kumamoto last month, it’s such a wonderful city! 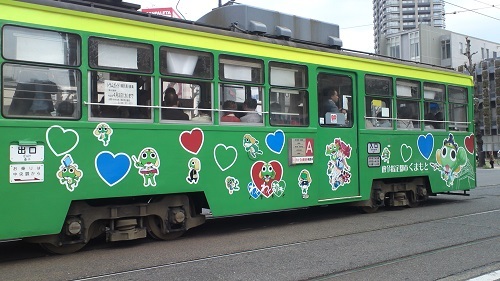 Even though we rode the tram multiple times, unfortunately we didn’t get to see the Keroro one. I think the ramen in Kumamoto is the best that we ever had in Japan. We ate at a restaurant called Komurasaki on either the Shimotori or Kamitori shopping arcade (sorry, I can’t remember which). Next time I go to Kumamoto I want to try the horse meat, I hear it’s really good! Oh yes, Kumamon, he is so popular in Kumamoto isn’t he? 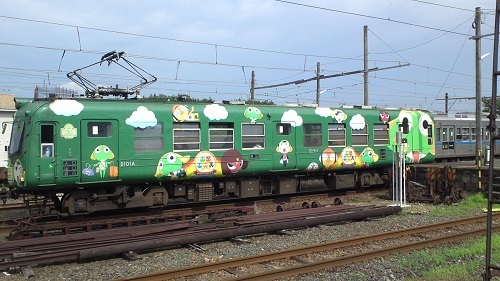 I didn’t actually get to see him but I rode on a Kumamon themed train, it was so cute! You’re right, I did see Kumamon souvenirs throughout Japan. That’s so cool that he actually made it to Harvard, I’d love to see him come to Los Angeles one of these days! Yeah, Kumamon has been to New York. He should go to L.A. next time!